People have told me I am plain nuts and there are days I actually kind of agree with them! I just turned 50 this fall and did I go on some exotic trip? Did I buy some shiny sparkle? Or perhaps indulged in a weekend spa? Nope! The only trip I took was diving into my cookbook collection; I bought sparkling new cookie scoops and enjoyed the steam of the proofing oven… Yep, I went ahead and started a new culinary venture! Yes, I am making Middle Eastern apps, baking Babka, challah and more, all the while “whistling while I work…” Who would have thought?? I did not know how much I would love everything about this process! To name a few: the quiet wee hours of the morning when the kitchen is quiet and the only sound is the hum of the oven, the frantic moments of loading my goodies and setting them up in our space, and finally – the laughter and community I experience when customers pick up their orders. Bring the 8oz water to a boil. While water is heating place the rest of the ingredients in a heatproof mug. 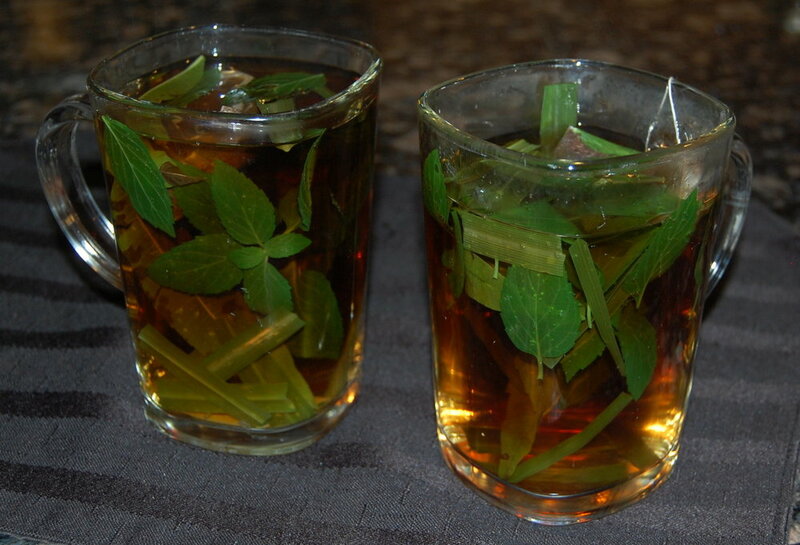 Pour the hot water over the tea bag, sugar and herbs and stir to mix well. Let steep for 2-3 minutes and drink hot.